The fragrance of this sake rises up gently. Junmai is made to carefully extract the characteristic fragrance and umami flavor from the Omachi rice, while retaining a neat crispness and umami flavor. The storage of this sake has been properly managed; therefore, when chilled, it is easy to drink and refreshing. If slightly warmed, the flavors become rich and mellow.  This is a sake that can be paired with both rich and light flavors, suits many dishes and moods, and is a good mealtime sake. This sake is made from Omachi rice that has been polished to half of its original size. A pure umami flavor of rice and an elegant fragrance are characteristics. When poured, a sweet, fresh banana-like fragrance lingers; the sharp, dry flavor of Omachi rice can be fully enjoyed upon taste. This sake can be enjoyed as an aperitif or with a meal. It is best enjoyed well-chilled. With Maiko Tsuji, the first female brew master in the prefecture, heading the group, nine young brewers have produced this sake through repeated trial with the concept of making a product that can be enjoyed by those of the same generation. Brewing using the old production method of 'botaimoto' (sake mash used since the mid-Heian Period to produce high-class sake) produces a special acid flavor that is a characteristic. This sake pairs well with fatty sashimi (sliced, raw fish) or eel, hard and semi-hard cheeses (such as Mimolette and Comte), and can be enjoyed chilled, at room temperature, or warmed. Since old times, the Mimasaka area has been known as "the land of delicious sake" and was established as such in 1804. "Gozenshu" sake was offered to feudal clans leaders; with cold climates producing plenty of high-quality water as a favorable condition and using mainly locally produced rice, continuous efforts were made to develop skills in sake-making; the result is a sake with a crisp, dry flavor. In 2007, having received training from the previous brew master, Maiko Tsuji is the current brew master and the first female brew master in Okayama Prefecture to fully lead sake production. In recent years, the movement towards using locally produced rice has strengthened; Tsuji uses 100% rice grown in Okayama Prefecture, with 50% of that being Omachi rice. "A sharp sake with an umami flavor" is synonymous for Gozenshu sake. The brew master works together with keen young brewers through trial and error with the goal of producing a sake that is easy to drink, and that one does not tire of drinking. Regardless of how good the equipment or facilities are, if the brewers do not have "feel" the sake, the sake will not be good. Tsuji believes that the personality of the brewer is reflected in the taste of the sake; as such, the brewers continue to work without comprise to make a better product. A place with special meals in a historic brewery. 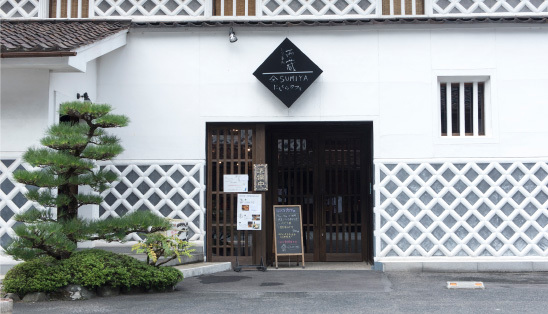 At Restaurant Nishikura, you can enjoy dishes unique to the brewery made with sake lees and 'koji' in a calm atmosphere. We are particular about even seasonings and flavorings, and use 'nuka-zuke' Japanese pickles, soy 'koji', salt 'koji', and more produced at the brewery. Enjoy meals at the restaurant and the beauty of vessels that have been preserved at the brewery for generations at the same time. 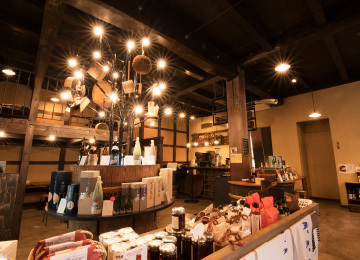 At Nishikura Café, you can relax in a space that is a renovated historic brewery. The delicious coffee is brewed in an authentic espresso machine in which beans roasted by a well-known local shop are used.